Residents of a northwestern Ontario First Nation who have been diagnosed with mercury poisoning are up to six times more likely to suffer from a wide range of debilitating health problems, a new report finds. That's among the conclusions from peer-reviewed research publicly released Thursday morning by Grassy Narrows First Nation. The community commissioned environmental health expert Donna Mergler, a member of a World Health Organization-affiliated research group, to study the fallout of eating fish caught from nearby waterways, which were contaminated by decades-old industrial pollution. "With this health survey and with the discovery of mercury, it's just a very dark picture," said Grassy Narrows Chief Rudy Turtle. "But at the same time, our people are doing the best they can to live under the conditions they're living in. "But we do need help." 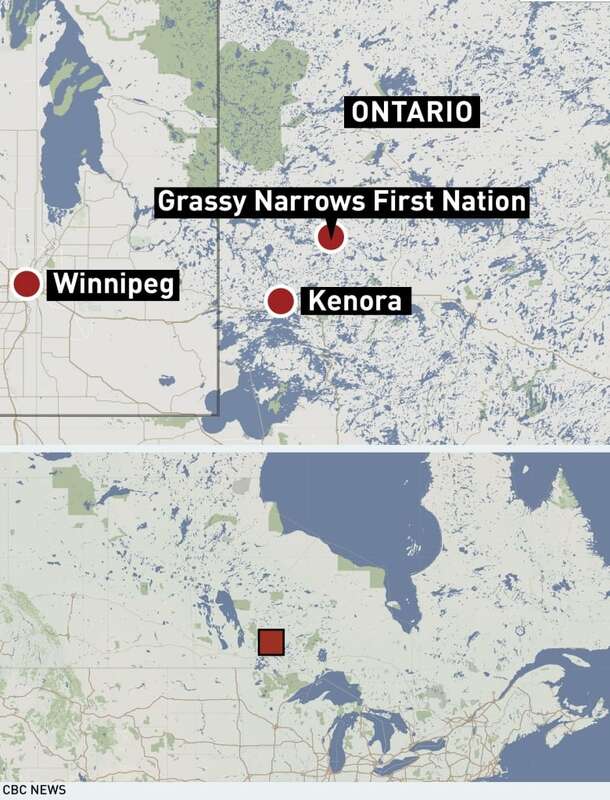 Grassy Narrows is located about 100 kilometres northeast of Kenora. Advocates for the community say it remains one of Canada's worst examples of the effects of legacy pollution. Former owners of a mill upstream in Dryden dumped mercury-containing industrial effluent into the English-Wabigoon River system in the 1960s and early 1970s. That contamination closed a thriving commercial fishery in the early 1970s and devastated Grassy Narrows's economy. With few local economic opportunities and little money, residents have continued to eat the fish caught from nearby lakes and rivers over the years. 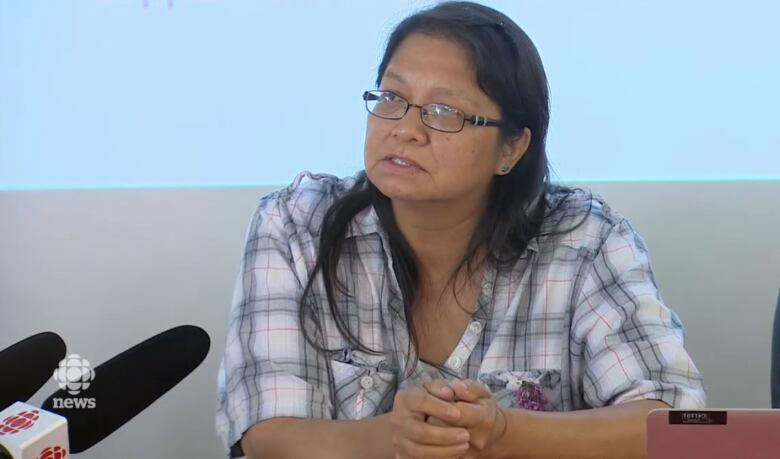 A report by fresh water scientist Patricia Sellers in 2015 found mercury levels still rising in some nearby lakes and Japanese researchers found more than 90 per cent of the populations of Grassy Narrows and Wabaseemoong First Nations show signs of poisoning. Mergler's report, community officials said, is "the most comprehensive assessment of the health of the community to date" and was compiled using data from a wide-ranging health survey of hundreds of households, as well as First Nations regional health surveys done in 2008 and 2010. The findings show some alarming trends. In general, the report found that the physical and mental health of people in Grassy Narrows is "considerably worse" than that of other First Nations in Ontario. As well, mercury exposure through the consumption of contaminated fish is associated "with poor health and well-being." The report also said that the health of the community "cannot be understood without taking into account their history of mercury poisoning." In general, only 21 per cent of Grassy Narrows members reported their health as being "good or excellent." That compares with 40 per cent in other Ontario First Nations and 60 per cent in non-Indigenous people in Canada. Almost six times more likely to have a neuropsychological disorder. Five times more likely to have stomach and intestinal problems. Four times more likely to suffer from a range of problems, including hearing loss and joint pain in people over 30 years old. Three times more likely to have blindness or vision problems. "It's been a devastation of a whole way of life, a whole … culture that we need to rebuild," said Judy Da Silva, the environmental health co-ordinator for Grassy Narrows. The likelihood of someone in Grassy Narrows reporting mercury poisoning is five times higher among residents whose father was a fishing guide, Mergler's research found. Also worrying, officials said, were the conclusions around suicide. Thirty-three per cent of community members reported losing a close friend or family member to suicide, which, according to the report, is nearly five times the rate in other Indigenous communities in Ontario. Twenty-eight per cent of respondents in Grassy Narrows had attempted suicide, the report found, more than double the rate of other First Nations. "We live with that big, heavy 10-ton elephant on our back," Da Silva said. Risk factors for psychological distress, which the report said is a major determinant for suicide, include food and financial insecurity, disability and chronic health conditions. "If any of you have ever had a family member or a close friend who has committed suicide, you know the anguish that it creates for each and every one of us," Mergler told reporters in Toronto on Thursday. "Here in a community, we're talking about one third of the people who have had a family member or a close friend who've committed suicide." Nearly 80 per cent of the people living in Grassy Narrows participated in the survey. Da Silva pointed to the quick response to the public health crisis in the wake of the Walkerton, Ont., crisis from residents drinking water contaminated with e.coli, contrasting that with the decades it took Grassy Narrows to begin to secure government commitments. "They got served justice right away," she said. "It's a shame on Canada, a shame on the province that we are treated so inhumanely." Mergler's report made a number of recommendations, including cleaning up the pollution from the river, and bettering a wide range of treatment and health care available to residents. The study calls for increased funding and better programs for treating physical and mental injury, a specialized long-term care facility in Grassy Narrows, programs for food security, including access to non-contaminated walleye and permanent institutions to facilitate traditional healing. "Remember, Grassy Narrows has many fewer elders," Mergler said. "That means they have fewer elders to pass on the traditions." Ontario has committed $85 million for the remediation of the river, with the money being secured in a trust fund. Da Silva said the community has been told actual remediation won't begin for another couple of years, as pre-cleanup engineering and sediment sampling work still needs to be done. In late 2017, Ottawa committed to funding a treatment centre. Having this study to add to the body of research on Grassy Narrows is "a sigh of relief," Da Silva said. "This expert, this world-renowned mercury expert, has found this evidence — that's what I call it, it's evidence."